A powerful artificially intelligent Earth probe, with a murderously twisted imperative, comes aboard the Enterprise and confuses Capt. Kirk as his creator. "The Changeling" was first broadcast on September 29, 1967 and repeated May 17, 1968. It is episode #32, production #37 and was written by John Meredyth Lucas, and directed by Marc Daniels (who was pictured on-screen as "Dr. Jackson Roykirk"). The crew of the USS Enterprise deals with an indestructible planet-destroying space probe. 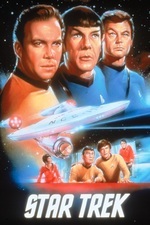 The plot contains similarities to the later 1979 Star Trek film. This episode is one of only a handful in the original series that take place entirely aboard the Enterprise. The others include "Charlie X", "Journey to Babel", "Elaan of Troyius", and "Is There in Truth No Beauty?". The episode can be viewed on Netflix and Youtube. I remember being most disconcerted by how they resolve Uhura's mind-wipe. I realize she was never very fleshed-out as a character, but to erase her mind but then act like they can put her through an accelerated education and she'll be roughly back to normal, that's off-putting. Sure she learns to do her job again but how much is she still the same person after going through this? Also one of the classic endings where Kirk logics a computer into exploding. This time I was amused by how, just before beaming Nomad off the ship, he makes Scotty wait a few seconds so he can get another dig in. Like he has some very precise idea of how much provocation it takes to make a malfunctioning space probe made from two space probes mashed together explode. I thought it odd myself. In a few hours they get Uhura back up to "college level" and she will be okay? Also, the mysterious Scotty death and his reincarnation with no medical tools other than Nomad confirming that he is functional. With Nimoy dying this week, this was an interesting episode. I was focused on his acting which was superb. It showed a rather interesting Vulcan ability...Vulcans can meld with electronics. Not sure this was ever explored later? Not sure this was ever explored later? Somehow Scotty's death and resurrection didn't disturb me as much. I think because Nomad said and acted as if it were reversible. I accepted that was possible through handwavey teching the tech. But with Uhura, Nomad admits the damage can't be undone, and they show her being re-educated. Education isn't techy-tech, I know it has limits that mean we wouldn't recover the same Uhura we had before this episode.